Of all of these, for some reason, this is the one I feel like I failed to capture as I see it in my head. 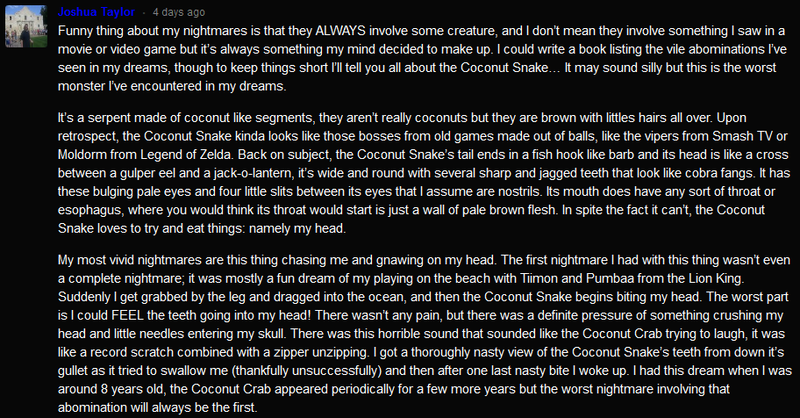 I'm glad a snake made of coconuts is anybody's recurring bogeyman. It also reminds me of an NES game called "Snake, Rattle and Roll." That wasn't a very good game but I sure played it a lot as a kid. Stickydot said this thing had no distinct body, or even any details like lips or teeth, so I end up picturing sort of a slug-whale. Or a deflated pac-man. 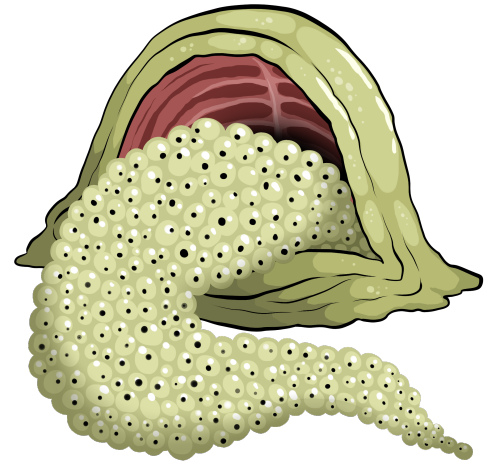 It sure is hard to draw a mass of eyeballs without them also looking like frog's eggs. 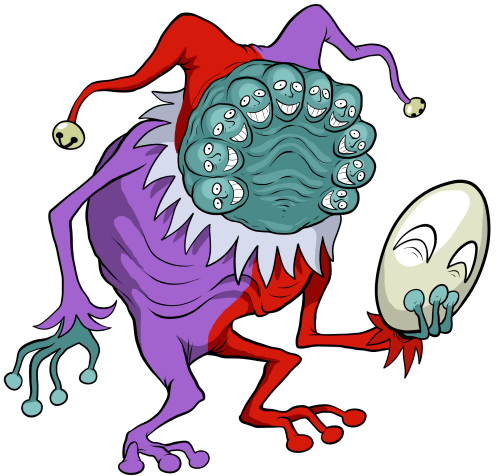 Anyway, I love the idea of a thing with a tongue of eyes, and especially a thing that takes you over by replacing your eyes. Beautiful. 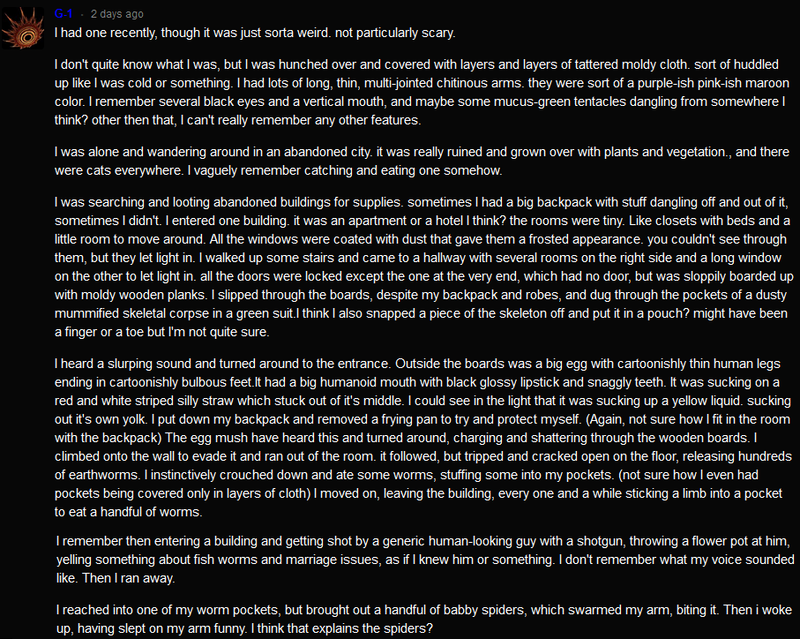 I didn't feel like I could leave out any part of this description. 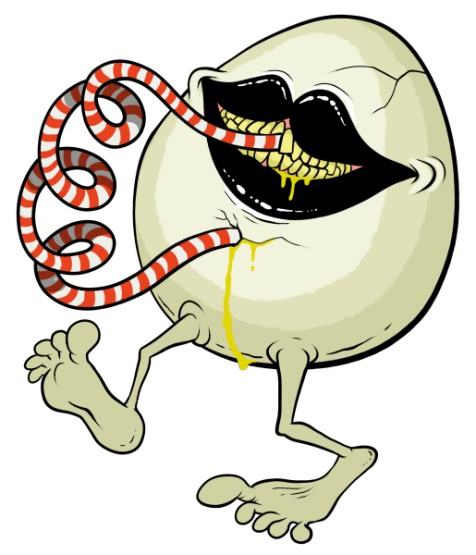 The dream's "player character" is certainly interesting, but the egg villain is the really frightening part, with the black lips and the sipping of its own yolk, and particularly how it was just filled with worms all along. 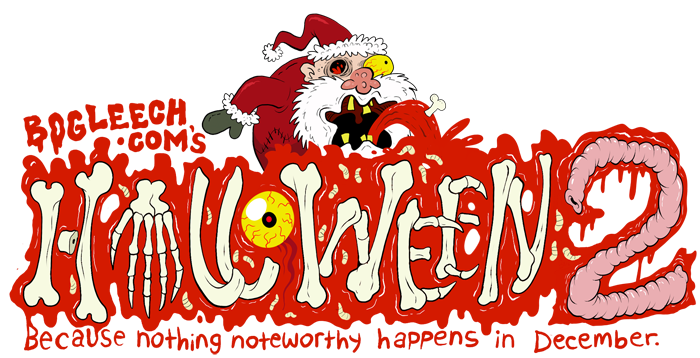 It wasn't easy to conceive of this one's appearance. 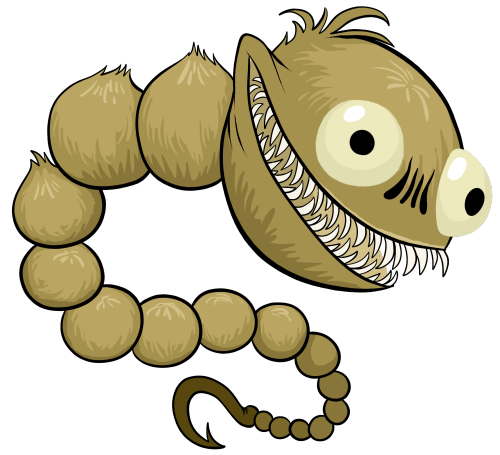 I'm pleased that this is another "good guy" dream monster, as utterly nerve-wracking as everything else about it ought to be. Ten faced frogclown is truly the hero we need and deserve. 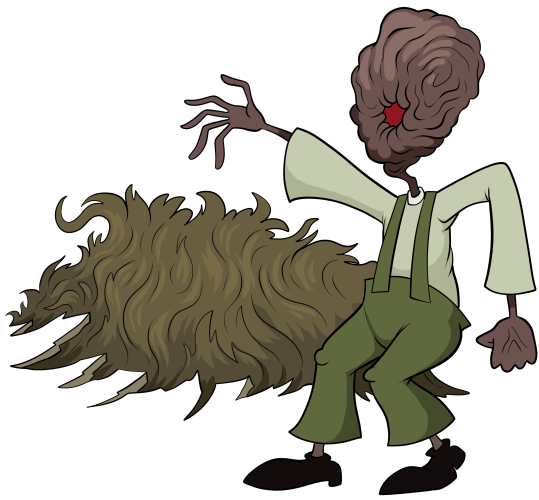 I know, this isn't quite how it happens in the dream, and his head probably looked more human than this, but my imagination really took "like a raisin" to heart. 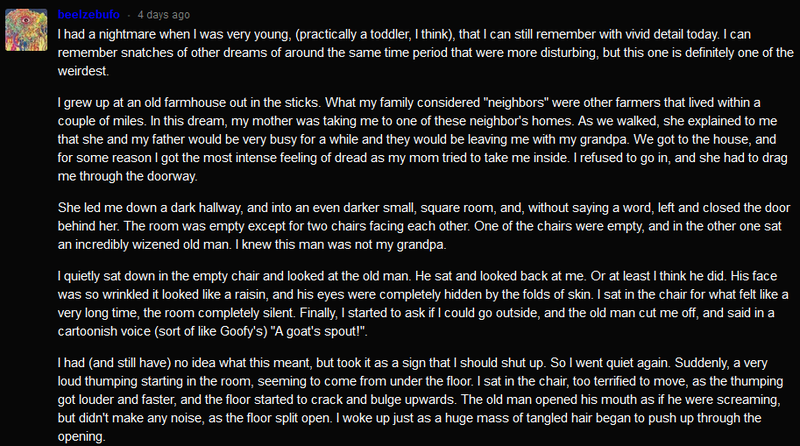 Every detail of this dream, and the way it's told, is one of the scariest damn things I've read all month, even counting the creepypasta entries, and those have been superb. It feels like something that might happen in the same setting as Eraserhead, and I think the very creepiest part of all is that this guy sounded anything like Goofy.